Heyward Howkins likes a good turn of phrase. The Philly by way of Oaklyn, NJ songwriter caught many a listener’s ear on his debut album The Hale and The Hearty with both evocative word choices and clever imagery laid gracefully atop breezy acoustic-rooted instrumentation. I digress. Point is, Howkins is a musician who likes to give his listeners a thing or two to chew on, and that continues on the new Be Frank, Furness, which gets its vinyl release via BITBY this week and celebrates Thursday night at Johnny Brenda’s. We hear alluring linguistic accents that draw our ears in – the long vowel sounds on “Nogales” (“the whiskeyyy is savoryyy”) and “Praline Country” (“you broke up the partyyyy when I said you seem funnyyyy”). We hear clever uses of imagery and local references – “Lorainne” has our songwriter either addressing a lady companion or the abandoned hotel on North Broad Street with the greeting “Lorainne, you look divine,” and “Be Frank, Furness” is a sideways play on a famous Philadelphia architect from the 19th century, but uses his first name as an adjective (“Let me be frank, Furness”). It certainly aids in appreciation of this album if you have an ear for lexicon, have driven along North Broad Street around Fairmount Avenue, or maybe studied Philadelphia history. But the best thing about Be Frank, Furness: you could be completely oblivious to Howkins’ writerly tricks and odd references and still find it a breathtaking work. This being his second album, the musicianship is stepped up. It’s lively, vibrant, and multi-layered. “Nogales” has a swift tempo and bright horns piping into the background. “Cut & Corral” is dare-I-say a rocker, with amps rumbling lightly, a big crescendo of piano and drums and a pounding snare-drum driven coda. “Pundit” shimmers with excitement under layers of keyboards and wind instruments…and you’d have to be deaf not to pick up on the very Springsteeny “woo-hoo-hoo” hook at the beginning of the song. Counterbalancing these more fervent moments are the contemplative folk spaces – “Rare Earths” is swift but drum-free, carried instead by softly rattling shakers and bells and striking a unique tone in its dissection of what culture means in the 21st century. “Sweet Tea Oleander” is about as spare as it was when Howkins recorded his Key Studio Session in 2012, with a slight bossa nova tempo and alluring keyboards. And “Flimsy Stock” closes the set off with delicate string and woodwind arrangements that sound practically choral. Short of a few spikes in pace, Howkins’ debut The Hale and the Hearty struck a gentle instrumental tone and rode it with elegance. This time around, he presents us with options, peaks and valleys, highs and lows and in-betweens. He’s as masterful a lyricist as ever, but on Be Frank, Furness we find Heyward Howkins painting pictures with instruments as well as words. 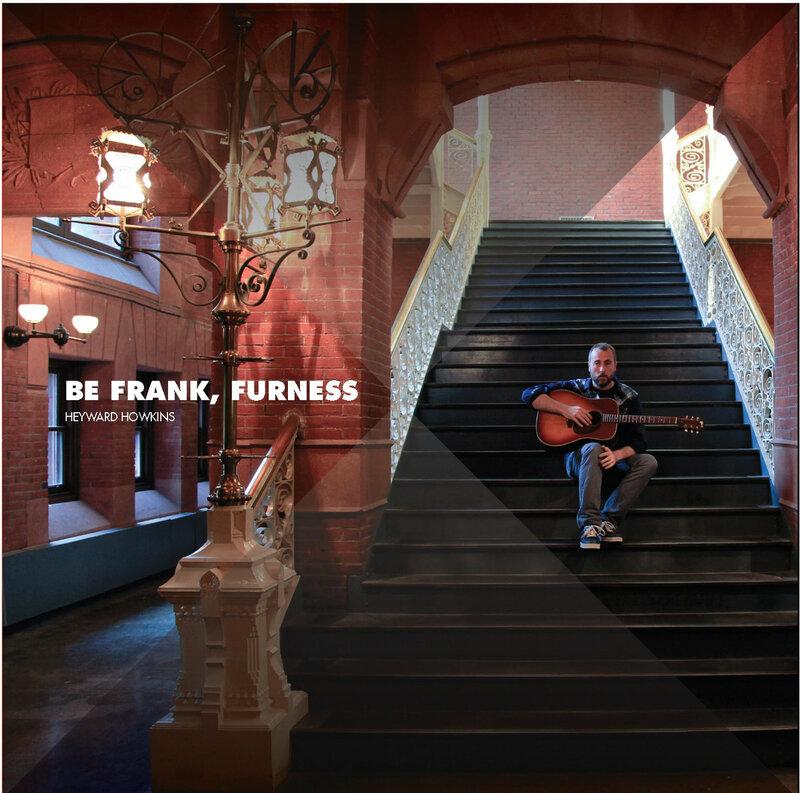 Be Frank, Furness is the featured album in this week’s edition of Unlocked. Download the song “Praline Country” in yesterday’s post and check back this week for video, an interview and more.